Swimming can be really frustrating for some people, especially if you didn’t start at a young age. Perfecting technique and timing is challenging enough and then you throw open water swimming and ‘sighting’ into the mix. But whilst you keep plugging away at squad sessions, there are a few things you can do out of the water that can have dramatic effects on your performance in the pool. 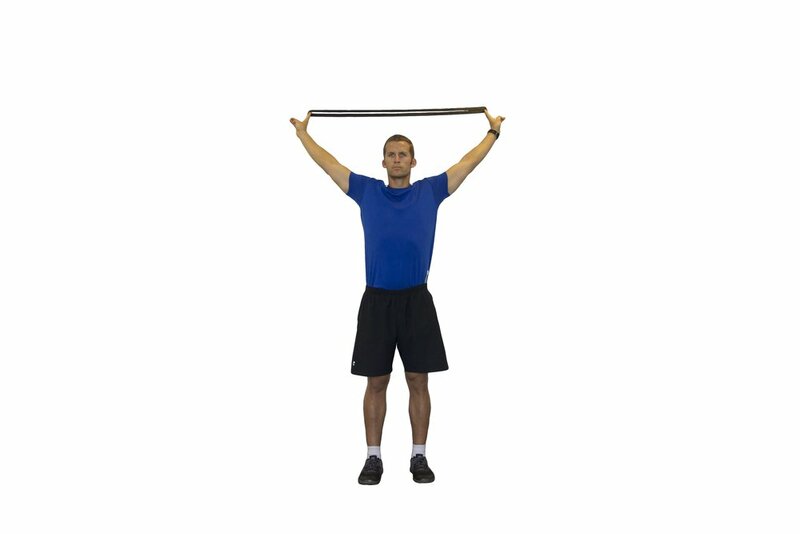 Holding on to the resistance band with both hands fully extend arms out in front. Maintaining an upright body position, straight arms and a tight core pull the band apart so hands travel away from each other. Try not to shrug your shoulders. Aim to pinch your shoulder blades together at the end of range. The closer your hands are together the harder the exercise. Why? : Scapula retraction is the action of pulling your shoulder blades together, (bringing them towards your spine). Good scapula retraction will stabilise your arm attachment to the body and strengthens your upper core. Now we don’t consciously retract our shoulders when we swim, but by spending time working on this out of the pool will ensure stability of the shoulder when under stress and prevent us from getting those nagging injuries. Try to maintain clean body lines, don’t hang off the straps or let your hips drop. Why? Upper body strength is essential if you want a powerful swim stroke. A great deal of core control and body tension is required to maintain a strong body position throughout this exercise, transferrable across to the optimal streamlined position in swimming. 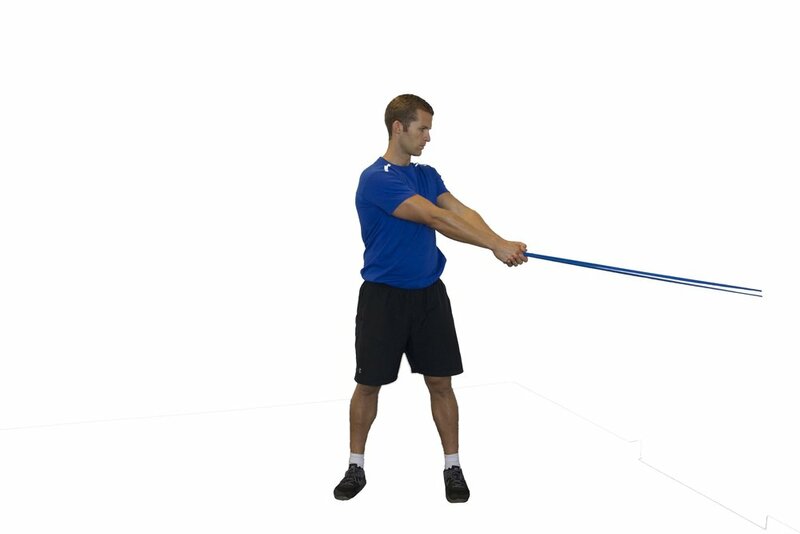 Using your resistance band tied to an upright, grasp the other end with both hands. Facing side on, keep your arms straight and pull the band across your body aiming for 180 degrees, maintain tension through your core and control back to start position. Why? : A better body position achieved through a strong core will help avoid that hip ‘wiggle’ and arms crossing your mid line, wasting time and energy. This will help to promote a good body roll in the water, giving you a longer more powerful reach and streamlined stroke.